A product spec and need from my email archive. This indicates how clarity in customer specs can help him get a working solution with less wastage of time and money. I am seeking assistance from someone that would assist me in designing a custom circuit for a prototype that I am working on. I would be willing to work out a mutually lucrative contract with someone who wanted to get involved with this project. Fault switch or Low level float consisting of a magnetic float encased around a tube with a no/nc reed switch. Trigger momentary switch to activate cycle. When momentary switch(3) closes for 2 seconds, pump(2) will activate (ON) for an adjustable time from 2-3 seconds. After pump(2) has activated an adjustable timed 10-60 minute countdown of the pump (off) will begin. Any additional signals from momentary switch(3)will not interrupt this cycle. If when cycle is complete a switch closure from momentary switch(3) still exists the cycle will repeat. If at any time circuit receives a signal (NC/NO) from fault switch(1-B) cycle will be immediately shut down and not restart until manual reset switch(4) is pressed. Notes: 3. Momentary switch to activate cycle could be in the form at current of an ultrasonic movement detector as seen here. I have not tested this switch yet to insure that it will perform the necessary detection capabilities, so this may change if a more suitable device is located. Notes:4 The reason for the manual reset button or circuit is that the float switch is very sensitive. 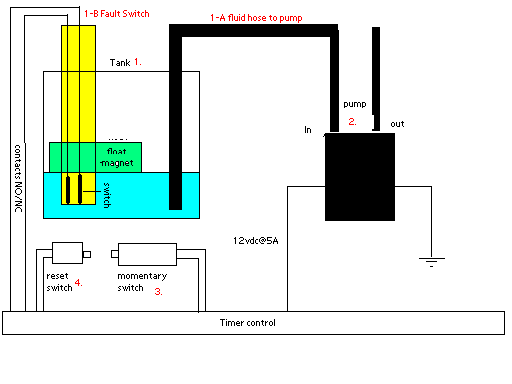 The potential exists that when liquid level is low and pump activates, the amount of fluid that the pump draws to prime itself, may momentarily fool the float switch into thinking that tank has become empty. When pump shuts down and pump looses it's prime a small amount of fluid will back flow from pump back into tank causing the level to fool the fault switch into thinking it has an acceptable level. I want to avoid a toggling effect that may be created when level gets into this level of liquid. General Notes: I have found several cyclic timers that could possibly perform the above list of requirements.